Tyrol Basin offers runs for skiiers and snowboarders with a 1000 foot long mogul run, two snow parks, the “Midwest’s best halfpipe”, and plenty of racing and special events. 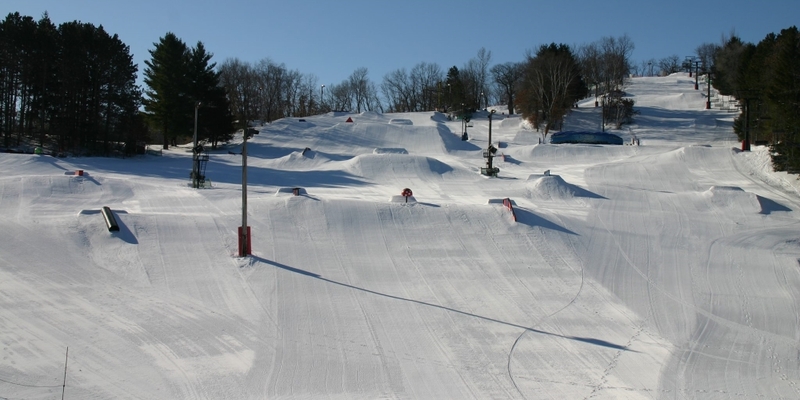 Located just 20 miles west of Madison, Wisconsin, it’s a great place for beginners to learn to ski or snowboard with free first time beginner lessons. Snowboards, skis, and the new short skis are available for rent. Spring Jam is May 4th on the Barnyard Rope Tow. Tickets are $20, open 9-5. Pond skim goes down @ 1:00! 50% off the following in the gift shop: beanies, facemasks, socks, snowpants, clothing (except Tyrol gear which is 20% off). Come out and have some fun! Tyrol Basin Legendary Pond Skim is going down Sunday, March 31 @ 1:00 PM. Don’t miss out on this event. Open Friday 12-9, Saturday & Sunday 9-5.